Everteen is one such brand that rarely disappoints. The brand constantly comes up with products keeping the needs of Indian women's intimate hygiene in mind. Removing bikini hair is one tricky affair. Women, generally prefer shaving or waxing to remove bikini hair but both have their own drawbacks. Shaving results in ingrown hair and nicks whereas waxing causes too too much pain. 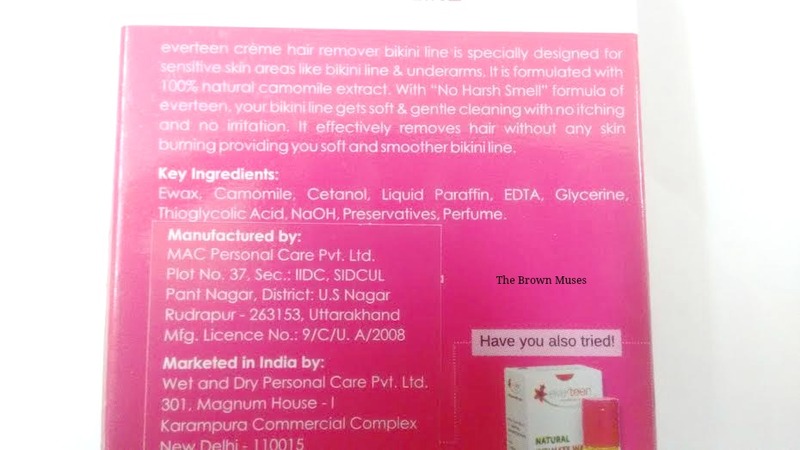 Everteen understood these concerns of women and came out with a product which is exclusively meant to remove bikini hair. The product goes by the name of Everteen Creme Hair Remover Bikini Line* which is formulated using 100% natural chamomile extract and contains no parabens, yaaaas! 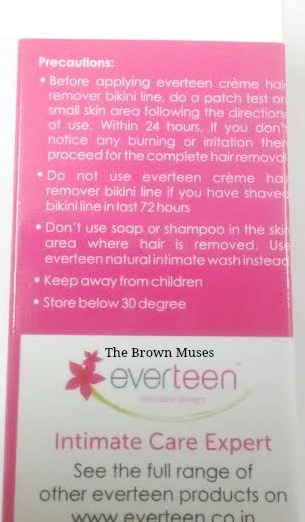 Everteen Creme Hair Remover Bikini Line comes in a carton that contains the hair remover creme in a plastic tube, a spatula, two coin sized towels and an instruction manual which contains lots of relevant information. The cardbox box contains all the details like price, ingredients etc. 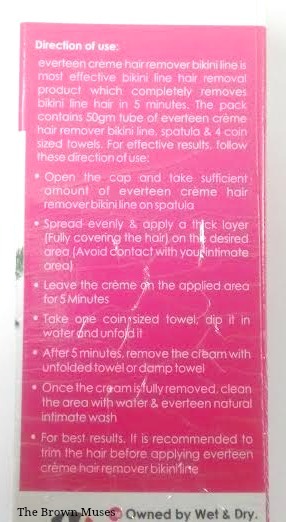 Before Everteen Creme Hair Remover Bikini Line, I had only used Fem hair remover creme about a decade or so ago when I was new to removing hair from the bikini line. It wasn't a very pleasant experience as it smelled awful and made the sensitive area dark! Never again I tried using a hair removing creme since then, but my opinion about hair removing creams changed after using Everteen Creme Hair Remover which was sent by the brand for consideration. In order to use the product, make sure you trim the hair as short as possible and please be super careful whilst trimming as you don't want to cut yourself. Trimming the hair would help in removing the hair efficiently and I learned this after my first experience. I didn't trim the hair as short as I could have and went ahead. The creme did remove the hair but not completely, however I did not give up and used the creme again after a couple of days and it removed the hair really well as the hair was short, so having short or medium length hair is the key if you want to get rid of hair completely in one go. I experienced slight tingling during my first experience but it was nothing scary. I didn't experience any irritation as such but a patch test is still recommended as the bikini area is super sensitive. So far, I've used the creme 3 times and haven't noticed any darkness in the bikini area. Overall, I quite liked the Everteen Creme Hair Remover Bikini Line as it removes the hair efficiently without causing darkness or irritation. Another biggest plus about the creme is that it is devoid of any pungent smell unlike other hair removing cremes which smell gross. I would recommend this creme to everyone who have been shaving or waxing down there. Removes the hair really well. Causes no irritation though a patch test is highly recommended. Contains 100% natural chamomile extract. Better than shaving or waxing. Regrowth doesn't feel poky or irritable. Full ingredients list is missing from the packaging, only the key ingredients are mentioned. The product retails at INR 149 for 50 gm. It is easily available on the brand's website here and many e-commerce portals as well as local chemists and cosmetics stores. Disclosure: *PR Sample but my review is honest and unbiased and is based on my personal opinion with the product.